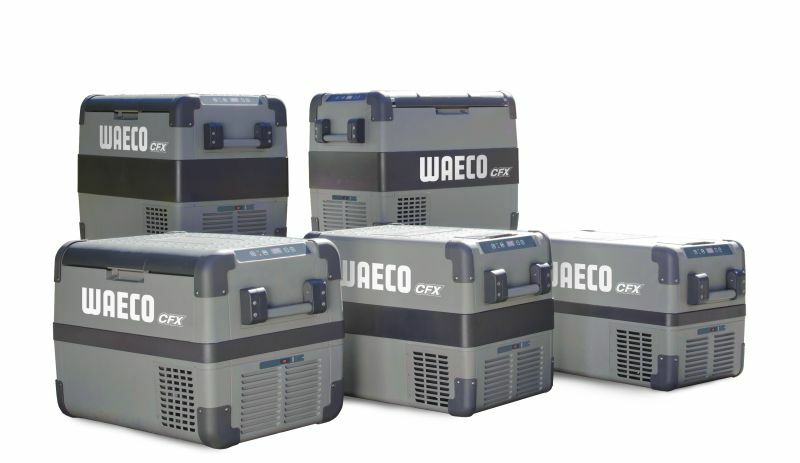 On Monday this week the all new WAECO CFX portable camping fridges hit the shelves of Tentworld - The Camping Experts. To say that we're excited about these fridges, and how well they're going to go is an understatement! We're blown away by how good they are. These new CFX fridges, fix up and improve on everything that the previous generation the CF fridges needed to take them to the next level. These fridges are market leading, they're jam packed with features and most importantly are tough! These fridges from WAECO really are the next generation of portable fridges, and it'll be great to see how they're taken up in the marketplace. The new range of CFX fridges replace the CF-35 with the CFX-35, the CF-40 with the CFX-40, the CF-50 with the CFX-50 and the CF-50DZ with the CFX-65DZ and the CF-60 with the CFX-65. Each of these new fridges boast additional litres in capacity, but with reduced power consumption! Wireless information display - AWESOME! This control panel tells you everything you could want to know, without having to open the boot! Control panel at opposite end to power leads. Making adjusting and checking your fridges status simple, especially when full. Improved floor plan layout, allowing for loading your fridge better. Drain plug at the bottom, making cleaning your fridge so much simpler! Retractable strong handles. Allowing your fridge to fit into a smaller space, or fit more gear around your WAECO CFX where previously it was wasted by your handles. More Power efficient!!! In most cases, up to 10%. What do you think of the new CFX range from WAECO? Let me know in the comments below!